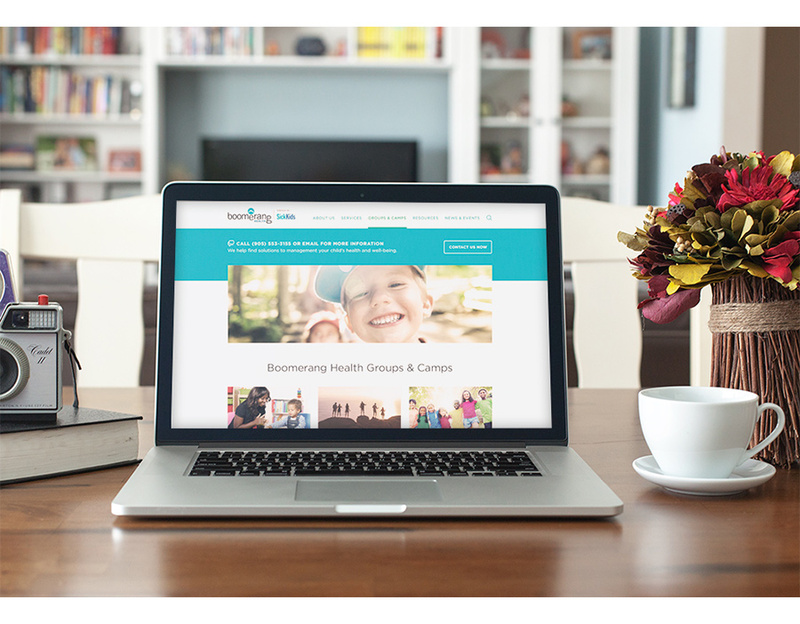 A look at the experience of creating a custom WordPress website design for a Toronto healthcare startup through the maturation and design evolution that followed three years later. A Custom WordPress Website Design from Web Analytics Data and Project History. 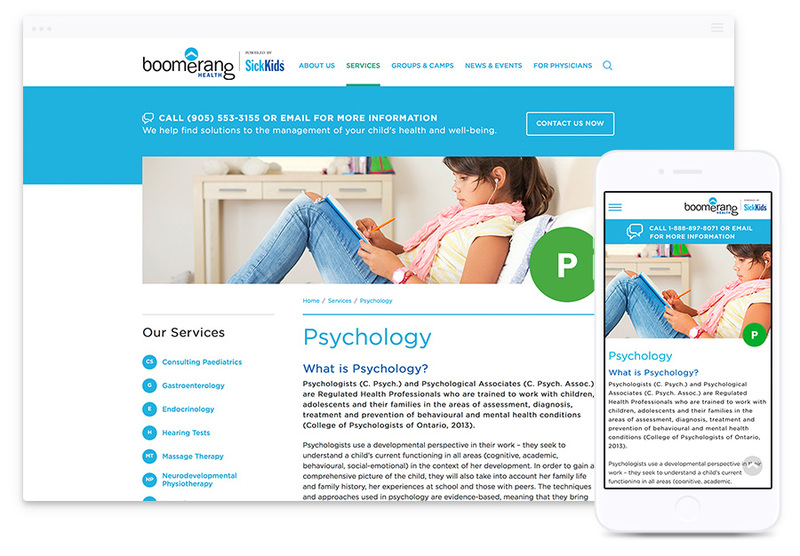 With the inaugural responsive website user interface design that our Toronto web designers created a few years ago for Boomerang Health Centre in Vaughn ON, we had very little actual user data to build the web design strategy upon. At that time Boomerang Health, which is part of SickKids Hospital, was still in startup mode. Using segments of website user data from other online properties owned by SickKids Hospital, we took a “tablet-first” approach, which worked out quite well for the pilot web design project. Several years later our Parachute Design team revisited the Boomerang Health responsive website design with loads of specific user data to work with. Using the web analytics, we created a new website design strategy and incorporated both client and patient feedback into the new custom WordPress website design. 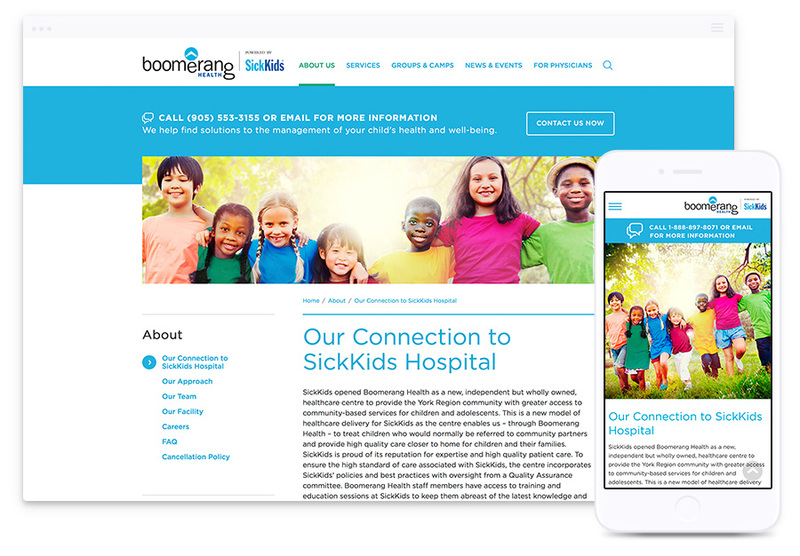 With the evolution of the Boomerang Health website, the restraints were loosened by SickKids and we had a little more room within the brand family to work with, given our long relationship with the organisation and familiarity with the strict branding guidelines. Our new WordPress web design approach focused more on utilising the complete Boomerang Healthcare branding colour palette that is utilised throughout the beautiful healthcare clinic. This allowed us to better marry the physical and digital experience that patients encounter when visiting Boomerang Health in person or online. Additionally, with the enhanced screen resolution and mobile devices available today, our Toronto web design team had much more room to run free with the website design and create a more complete and contemporary online user experience for patients and their family members. With the evolution of this healthcare organisation website design, our key challenges were clearly outlined in three tiers by Boomerang Health. 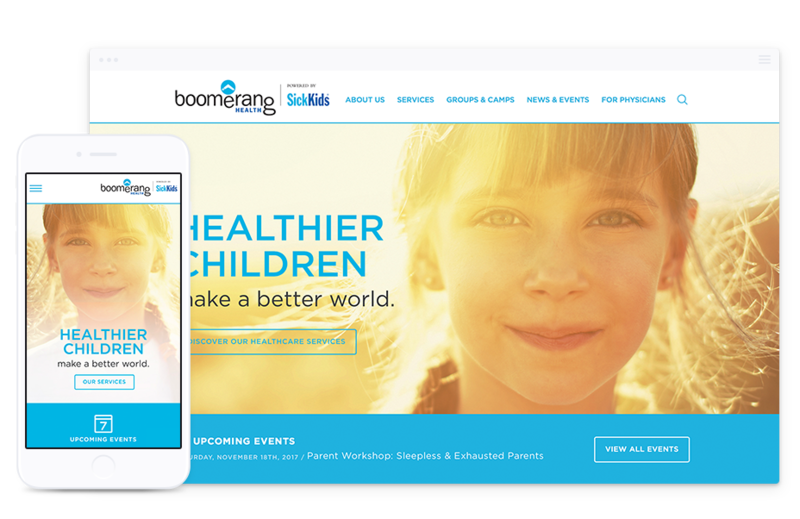 First, we were to place more emphasis on clinic news and events to increase community visibility and enrollment in Boomerang’s child-centric health programs. To achieve this, our web designers included a dynamic rolling events list that is immediately in view when the Boomerang Health website first loads. The website administrator can easily assign featured event and news posts to this area with minimal effort, and maximum exposure to Boomerang website viewers. Our second critical task was to increase the visibility of the clinic hours and contact information. We stepped up with a bold grey band that is virtually impossible to miss against the brightly coloured user interface. This information-driven band is also repeated above the footer of each web page for better visibility and access to patients at all times in the website experience. Our third mandate within the website design evolution was to offer more opportunity for customizable Calls-to-Action throughout the user interface, in order for the website administrator to change online marketing efforts on the fly. Our Toronto web designers developed a tool in the new Boomerang Health website that allows the admin to include a band with a custom message, button, and link, to any part of the website or external services. This allows Boomerang Health to better manage and target website messaging for their audience and ultimately increase conversion rates. What our client had to say? In conjunction with our on-site search engine optimisation efforts, and due to our standing relationship and collective trust with Boomerang Health, Parachute Design was invited to take part in the selection process of a Search Engine Optimisation agency to join our team and help increase the visibility of the new Boomerang Health website. We reviewed several proposals from various local SEO Agencies and advised in the selection process to determine a knowledgeable and suitable SEO partner. The SEO agency was involved in the project from the early stages, offering input during our website design strategy phase and later on, in the design and development of the website. Working together, we combed through the beta website refining each and every web page for maximum visibility before deploying the new custom WordPress website design. Concurrent with the deployment of the new Boomerang Health website, our Toronto web design team put together a series of web and print advertising, to be used strategically in growing Boomerang Health’s brand awareness around the Greater Toronto Area. As with all new website deployments, Parachute Design carefully monitored analytics data for 90 days in order to identify any areas in need of improvement or further refining in regard to content and landing page design (or graphic content), to ensure the Boomerang Health website was performing at peak levels. Shortly after this stage, we invited the team at Boomerang Health for a screen share tutorial session before handing over the keys to their new custom WordPress content management system (CMS). Within 30 minutes they were off publishing new content on their own! Providing professional website design and development services in Toronto, Ontario for nearly 15 years, Parachute Design offers expertise in web design for healthcare organisations, in addition to creative brand and logo design. To learn more about how our Toronto web design company can help your business with expert logo design, branding, and responsive website design, or to request a proposal, please complete our online quote request form, or call our Toronto branding and website designers at 416-901-8633.